My Persian friend sent me a link to these images of the medical crisis in Gaza. The images are disturbing, but they are real, and I feel like we need to look at these images to realize the horrors governments around the world impose on innocent people. 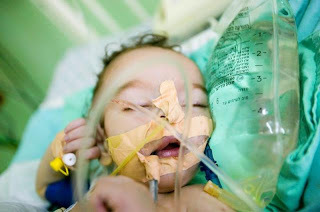 For any parent that has had a child in the NICU, these images bring up memories of difficult times; however, I am so ever thankful that the hospital my son was treated in had paper towels, medicine, etc. 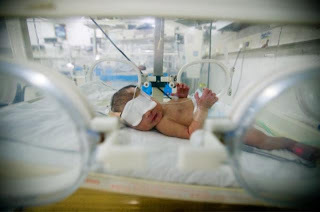 The neonatal ICU ward in Al Naser Hospital in Gaza City, Gaza Strip Occupied Palestinian Territory, May 13, 2006. Doctors at Al Naser do not even have paper towels to dry their hands with before assisting patients much less the essential sterilised linens needed to prevent infection and death in infants and those with with compromised immune systems. Many infants in the Neonatal ICU are suffering from severe bacterial infections due to the lack of sterilised equipment and linens. GAZA CITY, GAZA STRIP OCCUPIED PALESTINIAN TERRITORY – May 8, 2006: An infant with a compromised immune system suffering from severe bacterial infections which were a result of the lack of sterile equipment in the hospital is treated in the Neonatal Intensive Care Unit at Al Naser Hospital in Gaza City, Gaza Strip Occupied Palestinian Territory, May 8, 2006. Doctors at Al Naser do not even have paper towels to dry their hands with before assisting patients much less the essential sterilised linens needed to prevent infection and death in infants and those with with compromised immune systems. After the cessation of aid from America and EU countries, hospitals in Gaza have literally run out of medicine and supplies. Patients die on a daily basis from easily treatable conditions due to lack of supplies such as sterile linens, needles, medicine, chemotherapy treatments etc. 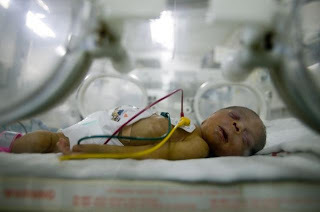 GAZA CITY, GAZA STRIP OCCUPIED PALESTINIAN TERRITORY – May 8, 2006: An infant severely dehydrated and near death is treated at Al Naser Hospital in Gaza City, Gaza Strip Occupied Palestinian Territory, May 8, 2006. This child has suffered malnutrition and dehydration due to the financial status of its family which has been without any salary for almost four months now. Hospitals are seeing a dramatic rise in cases of malnutrition and even starvation as local families run out of money, food and water. After the cessation of aid from America and EU countries, hospitals in Gaza have literally run out of medicine and supplies. Patients die on a daily basis from easily treatable conditions due to lack of supplies such as sterile linens, needles, medicine, chemotherapy treatments etc. Why US and European governments give the tax where people pay, to Israel to do these war crimes and associate their nations in blood of women and innocent children? Hamas was selected with Palestine nation vote. Why Israel surrounds Gaza and don’t let wounded persons receive food and drug? Isn’t Israel a occupier?? Isn’t this an unfair war? Who has equipped Israel with F16 fighter plane? I think Democracy and Human rights is a big lie in West.